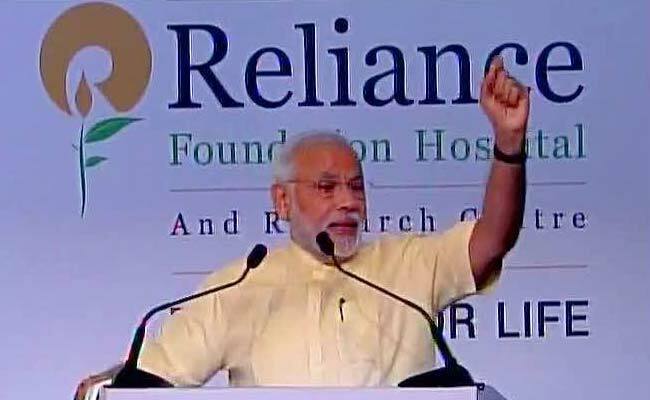 MUMBAI: Prime Minister Narendra Modi blended a bit of Indian mythology with tech talk to underline the need for urgent changes in the healthcare sector while inaugurating the 19-storeyed new wing of the H N Reliance Foundation Hospital in Girgaum on Saturday. Despite the plus points, India hasn’t been able to provide a good healthcare system for its people. India’s infant and maternal mortality ratio was quite poor, he added. “The poor face immense difficulties. If a poor person falls ill, the entire family can starve,” he said, underlining the importance of bringing healthcare benefits to the poorest of the poor. It was here that his government’s ‘Make in India’ initiative could help by finding cheaper ways of manufacturing medical devices that were at present beyond the common man’s reach. “Equipments are costly. We took up the Make in India initiative. Why cannot we encourage making of medical equipment in India?” he asked. Modi congratulated industrialist Mukesh Ambani and wife Nita for “renovating” the 95-year-old H N Hospital into a high-tech hospital. Society and government should together give priority to the poorest of poor and make all-out efforts to provide affordable health services, he said, adding that the H N Reliance Foundation Hospital was a step in that direction.